This article has been updated the last time on October 7, 2016 and the given information may be not accurate anymore. Feel free to contact me on twitter to get more details. Last week I wrote about discoverability of progressive web apps and as part of this I also thought about current ways a site gets promoted as an app by browsers. 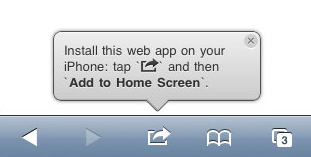 To get the app banner with the “Add to homescreen” dialog for your site it needs to meet some criteria. The site needs a valid manifest, a service worker and the site has to be served over https. From some testing it seems you need at least an icon with 192×192 to get the app banner, but I would suggest to also add at least the 384×384 and 512×512 icons. Read more about the ideal sizes on developers.google.com/. You also need a Service Worker to get the app banner. 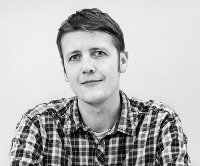 As Service Worker also requires TLS your site also needs to be served over https, which it should anyway. To test “Add to homescreen” open Chrome and Devtools. Next activate the Device Mode (Ctrl + Shift + M) and open the menu on the top right of the screen. Click “Request app banner…” and you will get a dialog to add the site to the shelf (Desktop). If you don’t get the prompt have a look in the console. For example, if the icon is not suited you will get the following message: “App banner not shown: manifest does not contain a suitable icon – PNG format of at least 144x144px is required, and the sizes attribute must be set”. There is also a Manifest Validator to test your Manifest and find potential errors. One of the most asked question is if it is possible to show the app banner on user interaction. In short, NO. The long answer is that it is and will probably never be possible, mainly because of the fear of abuse. You may all remember the pop-ups we saw on iOS and also Android to show users how to add the site to the home screen. This can be really annoying and therefore browser vendors try their best to only show the app banner if a user is likely to visit the site again and therefore has the need for an extra icon on the homescreen. I also would like to have the option to trigger the app banner on user interaction, but I fully understand that this would lead to every site doing it. After some time, most users will be annoyed by all the prompts and will think only negatively about app banner. That’s why we better leave it to the browser when to show the app banner. If your site meets all the requirements and a user visits your site regularly you will get the automatically shown app banner. As far as I know the app banner is only shown on Chrome for Android at the moment (April 2016) but I am sure other browsers will add something similar in the future. If you build a progressive web app be sure to test if you meet all the criteria.